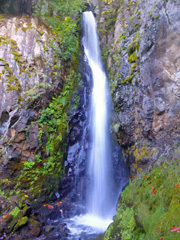 Hole in the Wall Falls is located .7 miles from Starvation Creek Trailhead in the Columbia River Gorge. It was created in 1938 by highway builders who, when faced with frequent flooding, blasted a whole in the bedrock and redirected Warren Creek away from the road. Hole in the Wall Falls now drops in tiered plunges (33' and 63') through a man-made pipe above the modern Columbia River Highway. Though Hole in the Wall's marketable name and story are better known, there are three other waterfalls in the vicinity of equal or greater interest. The first is Starvation Creek Falls, located just steps from the parking lot. Starvation Creek Falls drops 227' in two stages into a spacious, high-walled amphitheater. The creek expands here and bounces down rocky cascades to the Columbia River. Newly developed facilities make this an easy paved walk-up, with the unsanctioned option of scrambling closer. The second is Cabin Creek Falls, .25 miles from the trailhead. Cabin Creek Falls drops 220' in tiered plunges just steps from the paved path, though viewing angles are compromised by large boulders and trees. Boot track-scrambles lead to better looks, but it's still difficult to get the entire fall in frame. Hole in the Wall Falls is .7 miles from the trailhead. Turn left off the main road to a bridge over the plunge pool. Steep, well-established social trails lead to additional views. The Mount Defiance Trail narrows on single track past this point and begins a blistering climb to the summit (4,959'). But just before things get really steep you'll pass the Starvation Ridge Trail split (.85 miles : 297') and walk right by the lower tier of Lancaster Falls (.95 miles). This modest spray belies its full 303' height, which originates from springs directly above. As with the others you'll have to make a considerable - and precarious - off-trail effort to gain better views. Poison oak is ubiquitous along these cliff faces and creek channels - long sleeves are advised when scrambling off-trail to view waterfalls. Waterfall heights and types provided by waterfallsnorthwest.com. Camping is permitted in the Mark O Hatfield Wilderness, but there is minimal (if any) suitable camping along the Trail #413 route to Mount Defiance.